Site last updated April 6, 2019. ‘Harry DeArmond (born January 28, 1906, died October 12, 1999) invented the first commercially available attachable guitar pickup in the mid 1930s. He established a working relationship with Harold ‘Bud’ Rowe’s company to manufacture and develop these items. The company was located in a former schoolhouse at 1702 Wayne Street in Toledo, Ohio. Initially there were two models for flat-top guitars (the RH and the RHC which incorporated an integral volume controller) and two for archtop guitars (the FH and FHC with a volume controller). 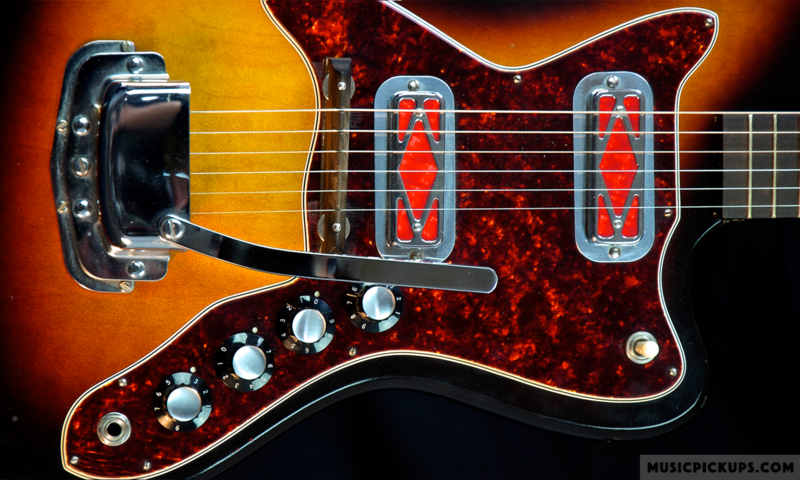 Both types of pickup, initially called ‘guitar mikes’, were passive electromagnetic, employing the same wide shallow coil shape with individual Alnico II pole-pieces. The RH type was flush-fitted into the guitar’s soundhole and retained with adjustable springs, to minimise damage to the instrument and to facilitate removal. As it projected only a few millimetres above the soundboard and had an edgewise, almost flush potentiometer knob, it hardly interfered with the instrument’s playability. The FH type comprised a coil assembly in a plain chrome-plated brass cover, fixed to a rod that lay parallel with, and just below the height of the sixth string. This rod was clamped to the guitar strings behind the bridge. The pickup could easily be slid along the rod from the bridge to the neck, providing a wide variation in tone. Its volume controller was in a separate small box, attached to the clamp behind the bridge. In 1948 (perhaps a year or two earlier) he introduced the world’s first effect unit for electric guitar, the Model 800 Trem Trol. This foot-operated floor-mounting unit comprised a mains voltage motor that rocked a small sealed bottle fitted with two electrical contacts and containing electrically conductive fluid. The variable frequency of the ‘make and break’ action of the mechanism created a type of tremolo effect. This effect unit was used by Bo Diddley and by many other artists. The DeArmond Model 1100 Adjustable Rhythm Chief archtop guitar pickup introduced in 1954, is considered by very many enthusiasts to be one of the three best pickups ever produced, the others being the Charlie Christian model and the P-90, both produced by Gibson. Gibson developed the P-90 as a direct response to the innovative Dynasonic Model 2000 guitar pickup produced by DeArmond and first used by Gretsch in the early 1950s. DeArmond pickups were factory-fitted to instruments produced by Airline, D’Angelico, Eko, Epiphone, Fender, Gretsch, Guild, Harmony, Hofner, Kustom, Levin, Ovation, Premier, Martin, Messenger, Microfrets, Silvertone and Standel. To promote the sensitivity of his pickups, Harry DeArmond developed a tapping technique, sometimes playing two guitars simultaneously. This method was later adopted by Jimmy Webster, Gretsch’s designer and endorser, and popularised forty years later by players such as Steve Vai and Eddie Van Halen. In 2004, there was scant information – mostly contradictory – in the public domain on Harry DeArmond and the products. Since then, that Wikipedia page has been copied and translated into many languages but up to the launch of musicpickups.com in October 2004, had remained the only source of accurate historical information on the company. That original Wikipedia site has been modified by many persons since shortly after going live. The majority of those modifications are factually incorrect – and the couple of glaring, deliberately wrong items in my original entry remain uncorrected. This site deals with music products (pickups, amplifiers. effects units and associated items) produced by the various Rowe-DeArmond companies based in Toledo, Ohio, USA only. The musical instrument producers listed on this site used a wide range of pickups from different manufacturers. However, only those instruments fitted with original DeArmond pickups are shown on this site. Although this site has been prepared in Ireland, due deference is given to the country of origin of these products. Therefore, where regional differences exist, spelling will be American English, and dimensions will show Feet and Inches first, followed by Metric equivalent. Differences in terminology also exist between English-speaking Europe and America. For example, vacuum tubes are known as thermionic valves in English-speaking Europe. Again, American terminology will be used throughout this site. All photographs shown on this site are the property of, and copyrighted to www.musicpickups.com, unless specifically stated otherwise. Apologies in advance for any photos due credits. Please advise me if your photos are missing due credit. This site is unofficial and is not associated in any way with The Cordoba Music Group (DeArmond), The Eko Music Group, The Epiphone Company, Fender Musical Instruments Company (FMIC), Fred W. Gretsch Enterprises Ltd., The Guild Guitar Company, The Harmony Guitar Company, Karl Hofner GmbH & Co., KMC Music Inc. (Ovation), The Martin Guitar Company and Eastwood Guitars (Messenger). As this site is the first vehicle in the public domain attempting to cover this comprehensive subject in detail, inevitably there will be some errors. Should you find any errors, please notify this site, ideally with the correct information. After all, the prime purpose of this site is to provide the truth – a diminishing commodity.